On yer feet. Like many of the secret coves we’ve included here, this one on the Isle of Wight is only accessible on foot, which means (hopefully) there’ll be fewer people there too. It’s a cute one when you get there too: colourful beach huts, rock pools for the kids and a je-ne-sais-quoi about the light that means you’ll want to take your SLR. If you’ve ‘done’ Ventnor, this is your next port of call. Drigg Dunes is a nature reserve loved by botanists and twitchers between Ravenglass and Seascale in the Lake District. The dunes themselves are home to many specialist plants and insects, not to mention the Natterjack toad. You can make a day of it with a 6 mile walk from Ravenglass or request to stop at Drigg Station if you’re taking the Cumbrian Coastal Railway. Either way you’ll be greeted with abundant rolling dunes and ample amounts of the sandy stuff. Move over Bamburgh, this dinky Northumberland delight with its stream and lush green land border is top of our beach haunts in the north. Walk to it from Howick or Boulmer, neither far from some of our cottages in Alnmouth. If you’ve got the entourage in tow, windbreakers and all, you can reach it by car (if you must) via Longhoughton. Shh… This one’s a real beaut and it’s remote. Considering it’s only a stone’s throw from Chelsea-on-Sea (otherwise known as Salcombe) it’s pretty unheard of. You can follow the circular walk from Salcombe along the South West Coast Path or drive and leave your car at the Soar Mill Cove Hotel then walk the rest of the way (approx. 2km). Oh and leave your phone in the car, you won’t have any signal on the beach. 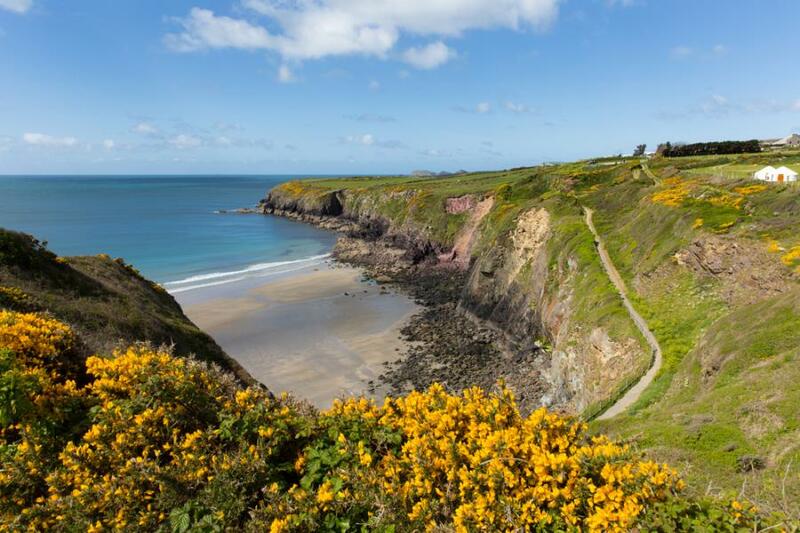 If you’re wandering the Pembrokeshire Coast Path you’ll join the lucky crew in the know on Pembrokeshire’s ‘secret’ beaches. Only this one takes some looking for. But if you like the surf, it’s worth the hunt and the walk from the parking at Stack Rocks. It’s about a half mile on from Flimston Bay, which is pretty tricky to access if your hands aren’t free. This is a rather special and historic place. It’s tricky to access down a steep path and really only usable at low tide, but the backdrop is unique. Perched next to this shingle bay is a derelict brickworks, abandoned since the start of World War I. Access is down a steep bank off the Anglesey Coast Path. Find your home along 125 miles of Anglesey coastline. If you’re up for a Bear Grylls type adventure this is the bay for you. Best if you start on two wheels and follow the cycle path from either Robin Hood’s Bay or Scarborough. The path tracks what was the coastal railway line, so the views are fab. This Yorkshire bay is surrounded by dense foliage – perhaps more David Bellamy than Bear but still – and except for the height of summer has a waterfall creating a rather unique rock pool. Not all that secret, if you’re a local, but a pretty cool place to hang out for the day whether you’re local or not. The sand here is almost white, not quite Caribbean but bear with us. This part of Norfolk is also home to Britain’s only desert island – Scolt Head. You can swim or kayak to it via a narrow, but deep channel at the west end of the beach, walk to it at low tide along the cockle path or simply take the ferry from Overy. On first glimpse this is an undisturbed crescent bay. But on closer inspection, this ragged outpost of remotest Dorset between Corfe Castle and East Lulworth is peaceful gem of intrigue. There are sea caves to explore, a grassy hill fort to clamber up and down, not forgetting the abandoned village of Tyneham so remote that the MoD absorbed it into what we now know as Lulworth Ranges. The beach is about a 20 minute wander from the parking but you won’t be disappointed. So where shall we rendez-vous?